First day in Israel. 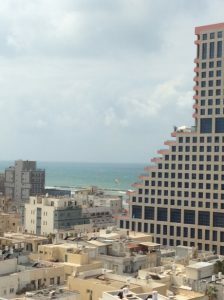 Stayed in Tel Aviv and walked to Jaffa the old city and port, overlooking the Mediterranean Sea.… It was a beautiful walk with parasailers on the way. 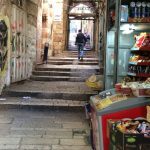 Jaffa is quite impressive with old stone buildings on narrow streets that twist and wind, but is actually now more of an overgrown flea market with shops overflowing with antique goods for sale and restaurants featuring Middle Eastern food. 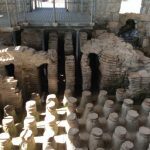 The port had been used for 4000 years, although it is no longer in use, and is the oldest continuously used port in the world. It started to pour later in the day and I took the city bus back to my hotel on the Ben Yehuda Blvd. Second day in Israel went to Yad Vashen, The Holocaust Museum. It was very painful to experience the extent of the horror and see so many pictures and listen to so many accounts of what went on during the Nazi regime. Beyond being Jewish, just being human and realizing someone could have the ability to convince so many people to take the lives of millions of others, and to do it in such a cold, calculating, horrific way, touches your heart and your soul. It’s hard to believe anyone can suffer so much and still fiercely yearn to survive. 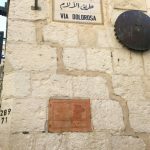 Later in the day we met up with an Arab guide who took us into the West Bank to the Church of the Nativity where we had a chance to see where Christ was born, to stand by the spot where the manger had been and where he was visited by the three wise men. 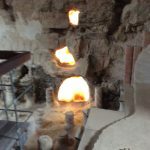 The Church of the Nativity is not one church, but rather three, with different levels, beginning with the cave-like below ground grotto over which was built two other aboveground segments, as the sect flourished and spread. Finally, we passed the Wall Israel built between the West Bank and Jerusalem which is covered with interesting graffiti, most of it surprisingly hopeful and upbeat, while sprinkled with angry words and aggressive images. 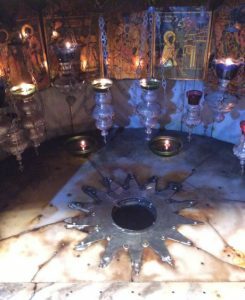 Here is the place Jesus was born. 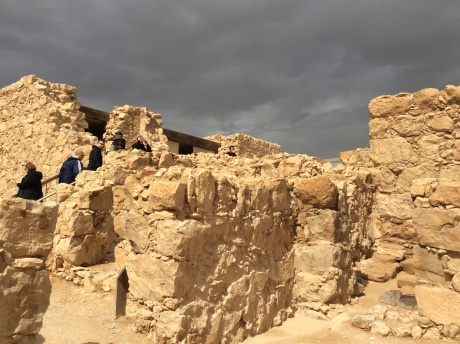 Day three: we visited Masada today which is a Roman palace built by King Herod during the Roman occupation of Jerusalem. 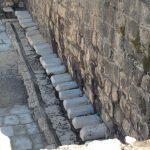 It later served as the holdout for what is referred to as the Jewish zealots or rebels, who tried to break the Roman rule and ended by committing suicide en masse rather than surrender to the Romans. The ruins our amazingly intact and there’s a fascinating aqueduct system that moves water into sisterns for preservation. We also went into the dovecote where they kept doves for food and communication purposes. 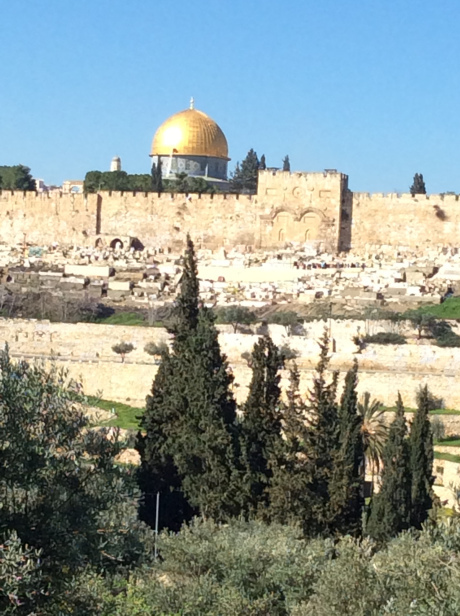 Day four: Jerusalem. 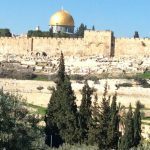 We began today on Mount Scopus with a terrific overview of the old city and the surrounding areas especially the Jewish mausoleums, strung like beads on the hillside. 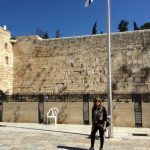 We then drove down to the Gethamane church and entered the old city through the Jaffa gate. 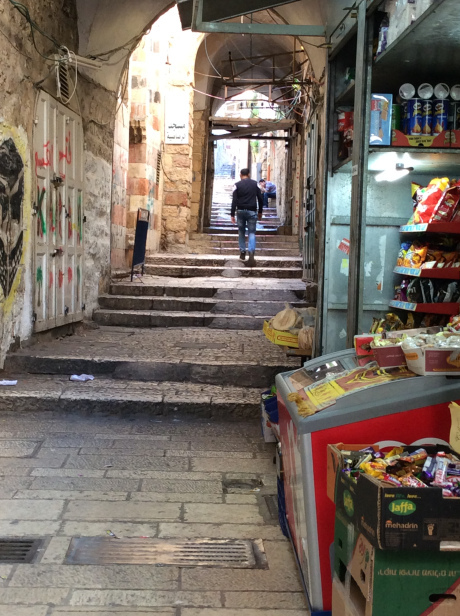 The old city is a marvel and is made up of Jewish, Christian and Arab quarters. 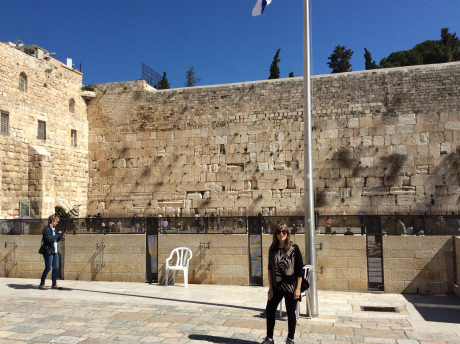 At the Wailing Wall, we left notes in the crevices asking for good fortune. 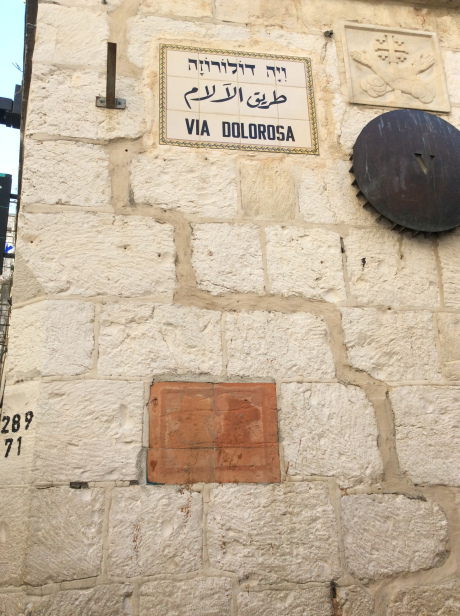 Next we followed the stations of the cross through the old city to the Church of the Annunciation where Christ was believed to be crucified and resurrected. An amazing day in an amazing city. Day five: we made our way to the ruins at Bet She an. This is an absolutely gorgeous Roman ruin with an amphitheater, shops, housing, bath houses and public toilets. It is unbelievably intact and was just breathtaking. 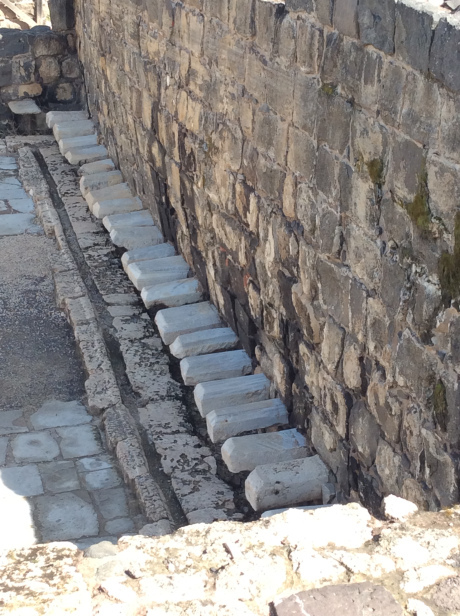 We next traveled to Nazareth to visit the well where Gabriel told Mary the prophesy and to a church dedicated to her. 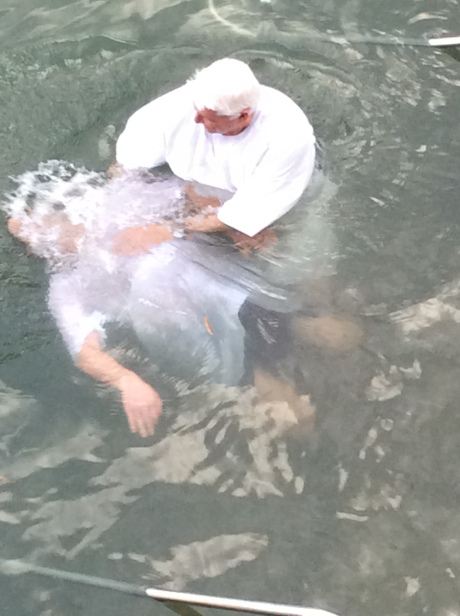 We proceeded the Sea of Galilee to a Baptismal center and watched baptisms. 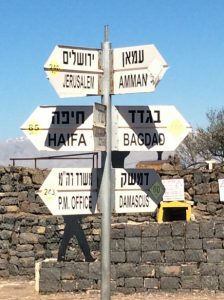 Day six: Today we drove to the Golan Heights where we visited the Syrian fortifications before the Six-Day War. We passed numerous areas where there are still landmines that the Syrians left behind near the present day border between Israel and Syria. At a coffee shop not far from the border probably heard the last Syrian bombings the day before the ceasefire on Feb 27 2016. 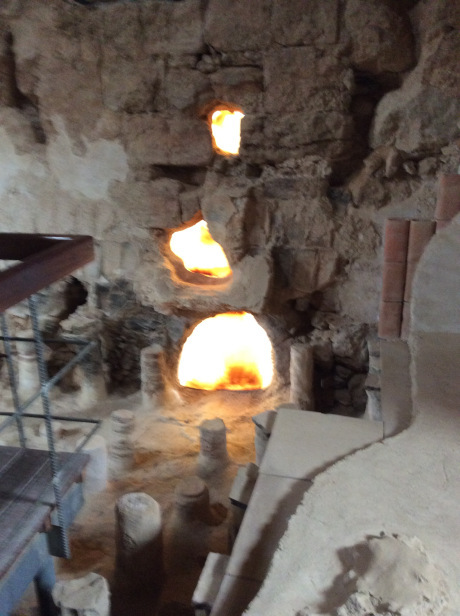 Next we visited Druze villages where we had lunch and learned about the Druze culture. Finally we went to the waterfalls at Banias which is the source of the Jordan River. And for icing on the cake, we drove up to the northern border between Israel and Lebanon. 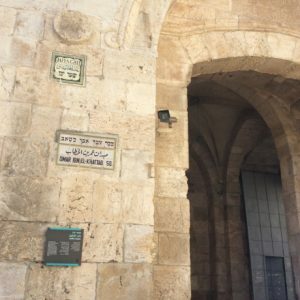 Day seven: Last day in Israel we visited the site of Old synagogue which was more a place to study the Talmud and Jewish law than to pray. On to Haifa afterwards and the beautiful center of Baha’i learning. 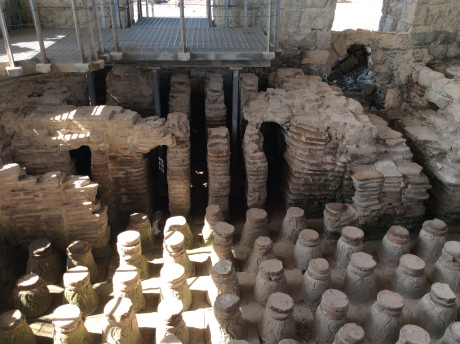 We wound down the day with a visit to Cesarea, widespread Roman ruins also built by Herod. When we returned to the car, the window had been smashed and the thief had gotten away with all my souvenirs. Since I was leaving to fly to Eilat that evening, it was too late to replace what was lost. It was a disappointing send-off. 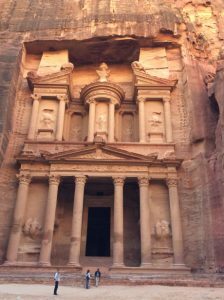 Day eight: If it’s the eighth day, it’s Jordan, and the spectacular Petra ruins. What an amazing Roman city. This is one of the main reasons I chose to make this trip, but in the middle of the outing, I was informed that I no longer had a room for the night and I’d have to pack up and leave my hotel. Which totally stressed me out and almost ruined my time. Add to that a disinterested and uninvolved guide who left us to wander on our own, and you have the formula for a disappointing afternoon. But the ruins themselves were so spectacular, they compensated for any and all distractions and disappointments. Imagine walking through a red rock canyon in Zion National Park and coming upon intact Roman ruins. 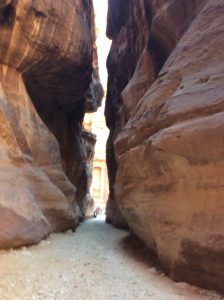 That’s Petra! When I returned to Eliat, the staff had packed up my gear because the tour company forgot to make my reservation for the night and the hotel was full. 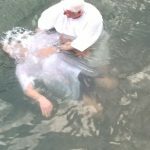 I was forced to make the crossing into Egypt at 10 that night, but it went smoothly and before I knew it I was in Taba, Egypt at the Taba Hilton. Only problem, the staff in Eliat misplaced my charger and I was without one. That threw me into a tizzy. How to survive without a charger on the road in Egypt? A true dilemma. Day 9: Day of traveling today. I drove from Taba to Sharm el Sheilh and then flew from Sharm to Cairo. Cairo is a city of 25 million people and the traffic jams attest to its size. It’s a mixed city of old and new with two separate sections, Cairo and Giza, divided by the Nile. The hotel in Giza has an extra charger so I am saved for the moment from cell phone hell. Tomorrow the pyramids. 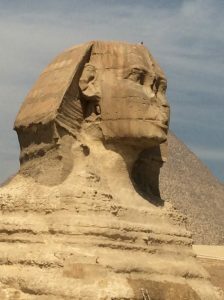 Day 10: I visited the 3 pyramids at Giza and entered one of them, before being taken by my guide to see the Sphinx. Then it was on to Saqqara to visit the open air museum/burial grounds, another pyramid I could enter and the Step pyramid of Djoser. At the end of the day, I entered a tomb with walls covered in incredible inscriptions and even some remaining paint. 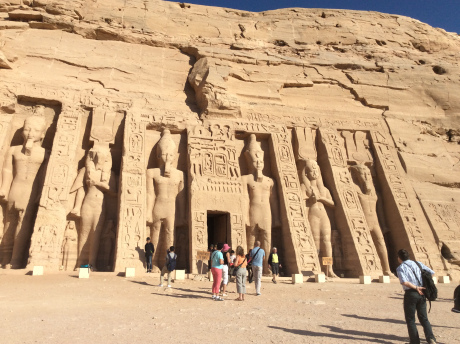 Day Twelve: Today I toured the amazing Karnak and Luxor temples with another wonderful guide, Mohamed. At night, I attended a sound and light show at the Karnak Temple. 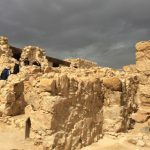 Day Thirteen: I visited the Valley of the Kings and entered 3 tombs. Then on to Queen Hatshepsut’s Temple. 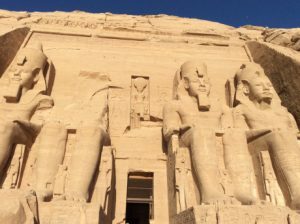 Day Fourteen: Sailed toward Aswan. Stopped at Edfu to visit the Temple of Horus and at Kom Ombo to visit the double temple dedicated to Horus and to the crocodile God Sobek. Visited the crocodile mummies and saw evidence of the advanced medical expertise of the ancient Egyptians. 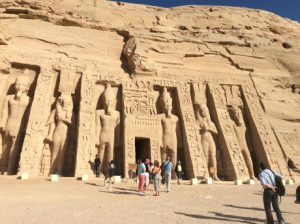 Last Day: Up at 2 A. M. and out by 3 to take the trek to Abu Simbel. Well worth the hassle. These are two of the most amazing temples I have ever seen. Both were built by Ramses II, one for himself and one for his wife, Nefertiti. A few years ago, they were in danger of being destroyed by the river and, to save them, they were moved inland brick by brick. 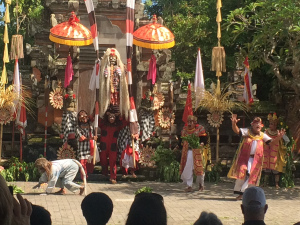 It’s difficult to conceive of moving these temples and restoring them to their prior condition. It was an engineering feat. 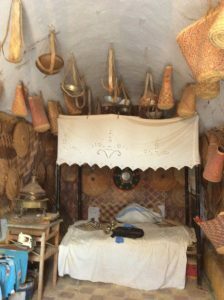 Today they are built into the side of hills three hours drive from Aswan. They towered over all of us mere mortals below and were replete with hieroglyphs and inscriptions inside. All in all, this was a marvelous trip. All three countries are chock-a-block with historical and socially significant sites and experiences. And contrary to popular belief, I never felt threatened or harassed. Au contraire, especially in Egypt, the people were lovely, warm and welcoming and I was well taken care of. The Egyptian people begged me to carry the message back home that their country is now safe and secure and ready for more tourists. Disclaimer: This was written before the last plane crash in May 2016. Hopefully, that will be attributed to mechanical failure, but if it’s a terror attack, I’m sure you’ll use an abundance of caution. 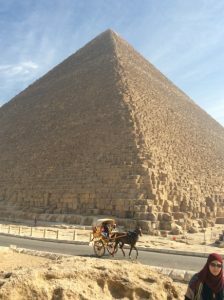 It is a marvelous time to travel to Egypt because there are so few tourists (I had personal guide for group rate), but if it’s not safe to fly, I can’t advise you to take the risk.